Pico Union Project will host another hybrid shabbat in its historic Sanctuary on Friday, May 27, 2016 at 8pm. 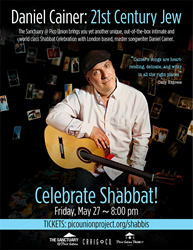 Pico Union Project is excited to announce another hybrid shabbat celebration with award-winning British composer, songwriter, producer and broadcaster, Daniel Cainer. Cainer will be performing his one man show, 21st Century Jew in Pico Union Project’s Sanctuary space on Friday, May 27 at 8pm. 21st Century Jew fuses music and comedy to tell personal stories illustrating the challenges and contradictions of being Jewish today. With cleverness, wit and great warmth, Cainer explores themes including ‘marrying out', an aunt that runs away to join a Christian cult and a cocaine-addicted rabbi, being beaten up by anti-semites on the way to synagogue, and a Tom Lehrer-esque, potted history of the bagel! Shabbat with Daniel Cainer is the latest installment in Pico Union Project’s monthly series of Shabbat events which aim to elevate the ancient Jewish teaching to “Love your neighbor as yourself.” Orthodox, atheist or religiously ambiguous, Pico Union Project Shabbat celebrations are a time to explore Jewish faith, culture or history in a safe space, often through the arts.